In this series, I examine inventory using a simple rule of thumb: Inventory increases ought to roughly parallel revenue increases. If inventory bloats more quickly than sales grow, this might be a sign that expected sales haven't materialized. 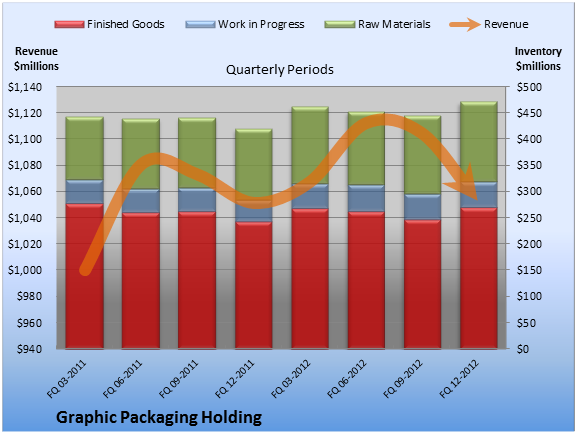 Is the current inventory situation at Graphic Packaging Holding (NYS: GPK) out of line? To figure that out, start by comparing the company's inventory growth to sales growth. How is Graphic Packaging Holding doing by this quick checkup? At first glance, not so great. Trailing-12-month revenue increased 3.1%, and inventory increased 12.0%. Comparing the latest quarter to the prior-year quarter, the story looks potentially problematic. Revenue grew 0.2%, and inventory grew 12.0%. Over the sequential quarterly period, the trend looks worrisome. Revenue dropped 4.7%, and inventory grew 5.5%. 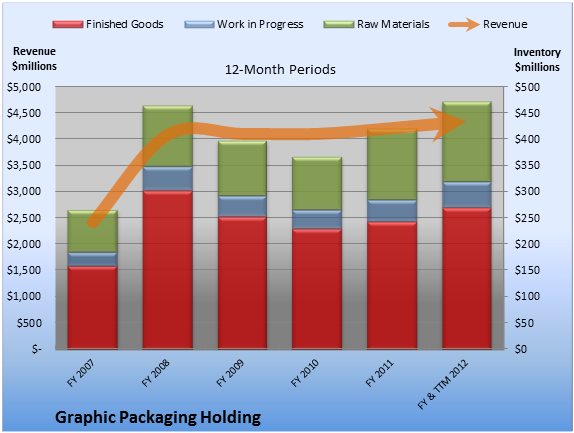 What's going on with the inventory at Graphic Packaging Holding? I chart the details below for both quarterly and 12-month periods. Let's dig into the inventory specifics. On a trailing-12-month basis, work-in-progress inventory was the fastest-growing segment, up 22.4%. On a sequential-quarter basis, finished goods inventory was the fastest-growing segment, up 9.6%. That can be a warning sign, so investors should check in with Graphic Packaging Holding's filings to make sure there's a good reason for packing the storeroom for this period. Although Graphic Packaging Holding shows inventory growth that outpaces revenue growth, the company may also display positive inventory divergence, suggesting that management sees increased demand on the horizon. Looking for alternatives to Graphic Packaging Holding? It takes more than great companies to build a fortune for the future. Learn the basic financial habits of millionaires next door and get focused stock ideas in our free report, "3 Stocks That Will Help You Retire Rich." Click here for instant access to this free report. The article Don't Get Too Worked Up Over Graphic Packaging Holding's Latest Numbers originally appeared on Fool.com.